Forrest responds, “It shore is good to be here, Saint Peter. I was looking forward to this. Nobody ever told me about any entrance exams Shore hope the test ain’t too hard; life was a big enough test as it was. 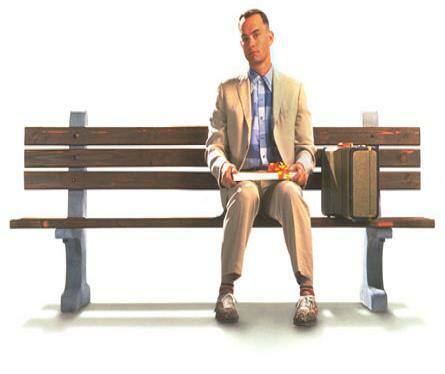 Forrest says, “Well, the first one, how many days of the week begin with the letter ‘T’? Shucks, that one’s easy; that’d be Today and Tomorrow. 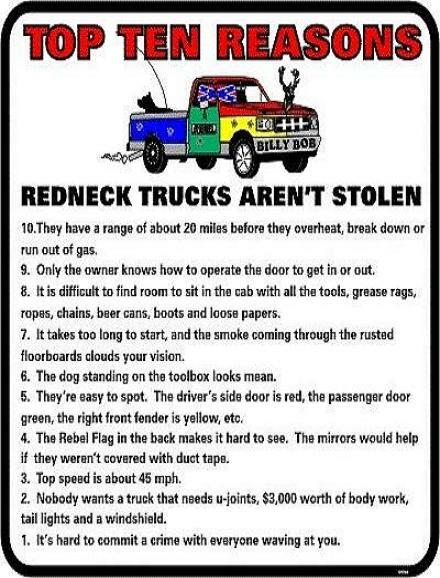 Top Ten Reasons Redneck Trucks Aren’t Stolen. 10. They have a range of about 20 miles before they overheat, break down or run out of gas. 8. It is difficult to find room to sit in the cab with all the tools, grease rags, ropes, chains, beer cans, boots and loose papers. 7. It takes too long to start and the smoke coming through the rusted floorboards clouds your vision. 6. The dog standing on the toolbox looks mean. 5. They’re easy to spot. The driver’s side door is red, the passenger door green, the right front fender is yellow, etc. 4. The Rebel Flag in the back makes it hard to see. The mirrors would help if they weren’t covered with duct tape. 3. Top speed is about 45 mph. 2. Nobody wants a truck that needs u-joints, $3,000 worth of body work, tail lights and a windshield. 1. It’s hard to commit a crime with everyone waving at you.